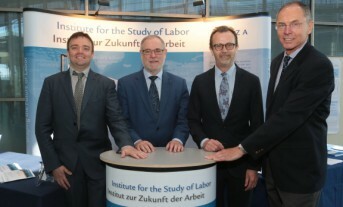 10th IZA and World Bank “Employment and Development” conference took place on June 4-5 in Bonn. Its main topic was the impact of the technological change on the labour market. Economists from around the world made an attempt to answer the questions regarding the technological change and its impact on the structural changes, how to support workers displaced from the labour market and what reforms of education systems should be introduced in order to meet the changes implied by the technological progress. During the special thematic session by the World Bank and the Network for Jobs and Development, which IBS is a member of, Piotr Lewandowski presented the article “Do entrants take it all? The evolution of task content of jobs in Poland”. Please feel invited to read our article and other papers on the conference website.